Apparently it's not just Steve Carell who has undergone a physical change for his role in director Bennett Miller's upcoming thriller Foxcatcher. When the first still from the film was released last month we noted that the former Office star was wearing a large prosthetic nose to play millionaire John du Pont, but it seems that his co-stars Channing Tatum and Mark Ruffalo have altered their appearances as well. Sony Pictures has unveiled two new stills from the film, and at first glance you may not recognize the stars. Based on a harrowing true story, Tatum stars as Olympic Gold Medal-winning wrestler Mark Schultz, who is desperate to find a way to come out from beneath the shadow of his brother Dave Schultz (Ruffalo), also an Olympic wrestler. Mark believes that he has a chance to do this when he meets du Pont, an eccentric multi-millionaire who offers Mark the chance to move in with him and train for the 1988 Olympics in Seoul. This turns out to be a bad move, as du Pont's turns out to be a paranoid schizophrenic with serious issues and his horrible coaching methods begin to break Mark down psychologically. 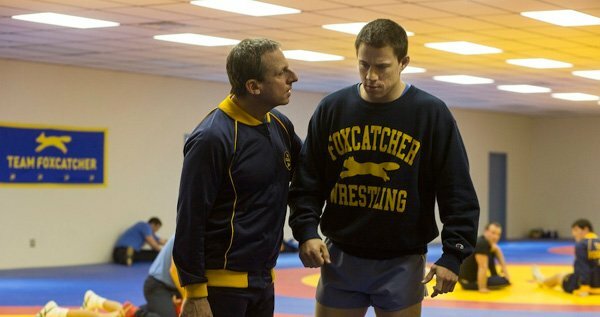 While Foxcatcher won't be in theaters until December, it will be having its premiere a month earlier than that. AFI Fest has announced that Miller's film will be having its gala world premiere at the festival in November, with Disney's Saving Mr. Banks set to be the event's opening night film. It's also been announced that the Coen brothers' Inside Llewyn Davis is going to be the title that closes out the fest. More films are surely going to be announced in the comics months, as AFI Fest doesn't start until November 7th. With any luck these photos are also an indication that we may soon see the first trailer from the film. I'm desperate to know what kind of voice Carell will be using for the part, as I can't imagine that his voice will be unaltered by that new schnoz. In the meantime you can just watch the trailer for Miller's last movie, Moneyball, and continue to get excited for the director's newest film.